Computer Errors: What can you do? So you’re working on the computer and you’ve been interrupted by an error message and you’re not sure what to do. Here we’ll discuss two things you can do when this happens. In the event that you call a computer tech to help resolve your problem it will be beneficial for the tech to see exactly what your error message looked like. This first tip will help with that conundrum. Posted in PC Education | Comments Off on Computer Errors: What can you do? Microsoft, like most software manufacturers, tries to make their software as simple to use as they know how. One method of doing this is to give multiple methods for accomplishing the same task. For instance; if you want to delete a selection from a document you’re editing you can 1) open the edit menu and select the delete option 2) right click on the selection and click the delete option 3) press the delete key on the keyboard. Everyone has their own method, and this post isn’t going to try and convince you to change your preferred method. It is however going to cling to the fact that, for many people, a keyboard shortcut is faster than multiple mouse clicks to accomplish the same task. Think about it; If you spend 8 hours a day working on a computer, and you found a way to trim two seconds from every minute you spent working you’d get an additional 16 minutes of work done each day. Or maybe you could get home 16 minutes sooner each day to watch Netflix! If you perform highly repetitive tasks then you could potentially save many seconds every minute by using keyboard shortcuts. So what are some keyboard shortcuts that you can use? If you’d like to know more keyboard shortcuts simply click on “Help and Support” in the Start menu and type “Keyboard Shortcuts”. You’ll find a list of hundreds of shortcuts to delight your fingertips and you’re boss’s bottom line. If you’re in the greater East Tennessee area and would like more information on increasing productivity by changing your computing habits; Call and we’ll come to the rescue! Quick or Advanced. Basic vs Expert. Typical or Custom… How many times have you been confronted by this question when installing new software on your computer? How often have you failed to noticed that you even had a choice? 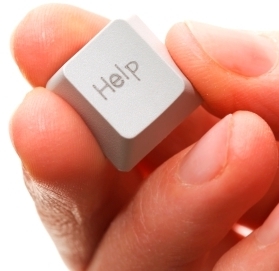 Most people choose the quick or basic option for fear of harming the software or their computer. Be warned; by choosing the basic (or quick/typical/standard) installation you may be forfeiting your right to choose what is being done with your computer. Another example relevant to this topic which sticks out in my mind is Microsoft Office. If you choose the “Typical Install” you will miss out on the opportunity to pick and choose which options will be installed with your Office Suite. If you were interested in support for additional languages, templates for Word or Excel, the Office Assistant, special filters, or many other options you’d be left having to re-insert the disc at some point in the future to add-on those options. If you’d have simply clicked “Custom Install” from the beginning you’d be able to setup the software exactly as you see fit right from the start. Pay attention – Software manufacturers are sneaky and often intentionally make it easy to overlook the option to change the installation settings. 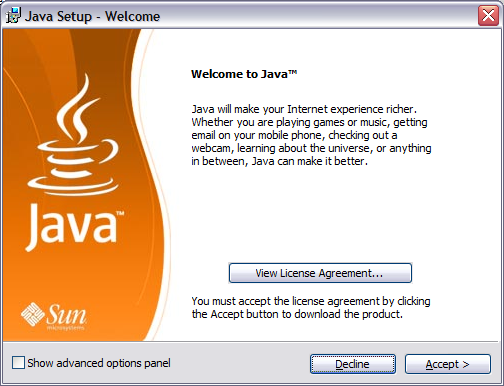 As pictured above in the first Java installation window, the checkbox is small and down out of the way in the bottom left of the window. Your attention is drawn to the “Next” or “Accept button so you can easily miss out on the chance to click the checkbox. Have no fear – There really isn’t much you can mess up. This is your opportunity to play computer tech. Even if you do find a way to mess it up, there is nothing wrong with uninstalling the software and starting over. It’s also noteworthy that custom/advanced installations usually have all the standard options pre-selected, so you’re not going to be left completely in the dark. 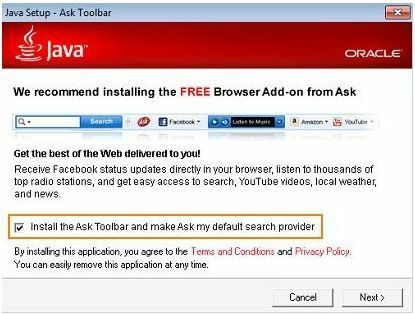 All you’ll have to do is look through the options and see if there’s anything you want to opt out of or anything you’d like to add to the installation. It is usually as simple as clicking a few checkboxes. Don’t fear the advanced options. You don’t have to be a technician to understand the options made available to you by clicking that “expert” checkbox. It may be the only way you can be certain what software is actually running on your computer. And if all else fails; Call and we’ll come to the rescue!